“My mom used to say, ‘All these young kids, all they want to do is change the world’,” recalled Carlo Mole, BA ’17. “But you know what: that is the ultimate goal. You want to be able to look back and say, ‘I did something, I changed someone’s life.’” Carlo’s family makes an impact through filmmaking – and someday, so will he. As a youngster growing up in England, Carlo saw the life of a documentary filmmaker up-close when his mother, an award-winning director, brought him to her shoots. “It’s hard not to get interested when you’re going to places like Bali after the bombings in 2002, or to Burma,” he said. His mother has earned acclaim for her complex and sometimes political films, which focus primarily on Southeast Asia. As Carlo learned, filmmaking can have real-world consequences. “People have ended up in jail because of her films,” he said. When Carlo started to think about where to go to university, he knew he wanted an experience that would enrich his perspective and help shape his vision as a filmmaker. 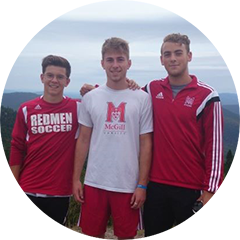 He immediately thought of McGill, which he’d heard about through a colleague of his mother’s, but was concerned about the financial challenge of studying overseas. After all, documentary filmmaking is not traditionally a lucrative career, and starting off with a mountain of debt was a serious concern. Carlo has been able to develop his passion for filmmaking between semesters of his degree in political science and history, attending a six-week documentary filmmaking course in Cuba arranged through a British university, and working as a researcher with his mother’s company. This summer, he’s looking forward to an internship at a production company in New York City. Thanks to these experiences and support from the UK Trust Scholarship, Carlo will emerge with a degree from a world-class university, and the confidence and experience to dive right into his filmmaking career. It turns out his mother was right: these young kids really do want to change the world.